The ideal tool for straight, miter and bevel cuts. Usable on any wood type, non-ferrous metal or plastic. This saw is suitable for all of all your scale miniature work from crown moldings to tiny quarter scale accessories. It is so versatile and durable that it is frequently used by model builders, toy makers, architects and even cabinetmakers. The smallest items may be cut cleanly, safely and accurately. The Proxxon FET routinely cuts parts to within a few thousands of and inch leaving an edge that requires no sanding with low noise levels and little vibration. Used by miniaturists, ship modelers and others who need to make small accurate parts. This machine that has become a standard of excellence in Europe is now available in the United States for 120 volt power. For cutting wood, non-ferrous metals, plastics, Plexiglas, glass fiber reinforced sheets, foam and many other materials. Stable construction because load bearing parts and plane-milled table are made of die-cast aluminum. 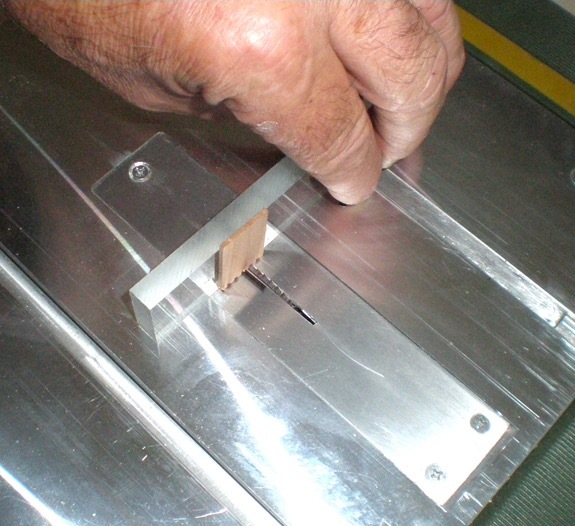 The longitudinal stop on the miter gage that is used for crosscuts can be precisely set by using the micro-adjusting screw. The blade height is adjustable and the arbor can be tilted up to 45°, which maks it possible to cut compound miters when used together with the adjustable miter gage. The saw has a direct current motor with compound belt drive and a ball bearing arbor. The included tungsten carbide tipped saw blade is 3 -9/64" (80mm) x 1/16" (1.6mm) x 13/32" (10mm) (24 T). A work piece pusher and a zero clearance blade insert are included. A dust collection port with a vacuum cleaner adapter comes with the saw. The Proxxon FET has a table extension on the left side with an integrated stop for crosscutting longer pieces accurately. The rip fence angle can be adjusted to insure precision cuts with minimal burning and maximum accuracy. In addition to the standard machine, we offer an auxiliary sliding table, a special sliding table for miters, a sliding table for taper legs and a finger joint jig. Most importantly we have adapted the saw to use blades that cut very smoothly and accurately. These blades are available in several thicknesses. 110 - 120V AC. 60Hz. 7,000rpm. Miter is infinitely adjustable up to 45°. Table size 12" x 12" (300 x 300mm). Saw blade diameters between 2”(50mm) & 3-11/32" (85mm). A hollow ground, High Speed Steel blade and adapter is available to accomplish very fine work and eliminate the need to sand any edges. Weight approx. 12 lb (6kg). We teach workshops at shows & at The Guild School. The ideal tool for straight, miter and bevel cuts. Useable on any wood type, non-ferrous metal or plastic. 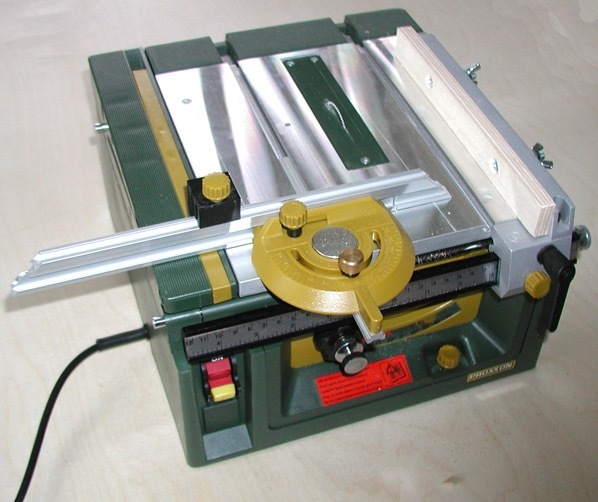 This saw is suitable for all of all your scale miniature work from crown mouldings to tiny quarter scale accessories. It is so versatile and durable that it is frequently used by model builders, toy makers, architects and even cabinetmakers. The smallest items may be cut cleanly, safely and accurately. The Proxxon FET makes cuts to very tight tolerances. The edge will require no sanding. There are low noise levels and very little vibration. We bring every saw we sell here to individually fit all the fixtures and install the auxiliary fence. Check with us for delivery information. Guaranteed against manufacturing defects for two years. Price does not include shipping from us. If the order cannot be delivered or picked up, there is an additional charge of about $25.00 for packing, shipping and insurance. ZERO CLEARANCE INSERTS for straight and bevel cuts make fine work safer and easier. PRECISION HOLLOW GROUND BLADE SYSTEM is needed for smooth cuts with no sanding required. AUXILIARY FENCE To permit cuts close to the rip fence such as rabbeted grooves along edges. SLIDING TABLE WITH STOP. Effectively enables cutting long or wide sheets safely and easily. Includes stop for accurate multiple cuts. SLIDING TABLE FOR MITERS. 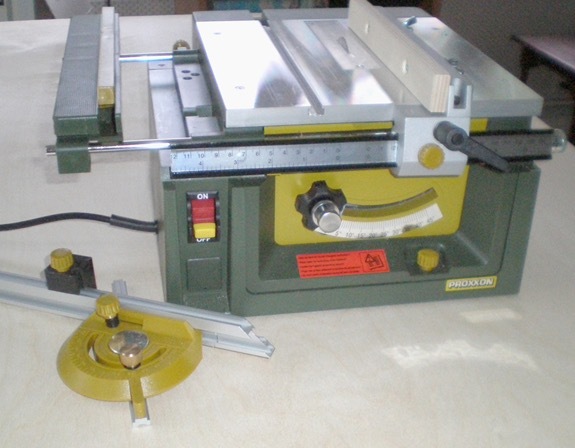 Is used for cutting picture frames and dollhouse molding trim quickly and accurately. Two side system is efficient for moldings. FINGER JOINT JIG. These are the interlocking joints that resemble through dovetails. The jig is used with an .064” blade. TAPER LEG SLIDING TABLE. 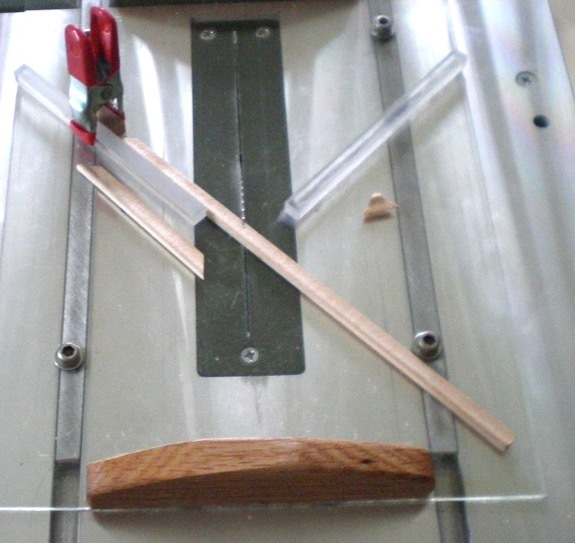 It is very difficult to hold a leg blank with the conventional taper jig. We have developed a sliding table to do this easily and safely. The fixture works with legs that are 1/8” to 1/4” thick. BLADES OF DIFFERENT THICKNESSES, The blade we use for most miniature cutting is .028” thick with 60 teeth. 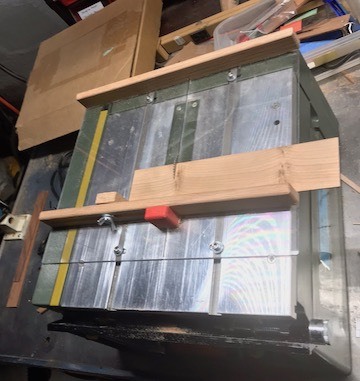 There is a .064”- 60T blade used to cut grooves to fit 1/16” lumber, a .032” – 60T blade to groove for 1/32” lumber, and a .020” very fine 132 tooth blade for cutting veneer and other thin material. Still not sure? Possibly one of our workshops could help you decide if there should be a table saw in your future.